The plaza is a location of great historic significance. Demonstrations in the 70s and 80s were often violently repressed by government troops. The funerals of martyrs Rutilio Grande, Oscar Romero and others took place on the steps of the cathedral facing the plaza. And troops stationed on top of the National Palace opened fire into the plaza killing and injuring dozens during Romero's funeral. 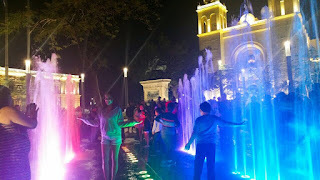 At the end of the war, thousands filled the square to celebrate the signing of the 1992 Peaces Accords, and in 2009 the crowds returned to celebrate the election of Mauricio Funes, the first popularly elected leftist president. It's not clear whether the new renovation acknowledges these historic events. There was also a bit of a feel that this was the start of Nayib Bukele's 2019 presidential campaign. 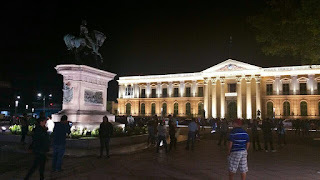 The renovation of the city's historic center has been one of Bukele's signature acts as mayor. 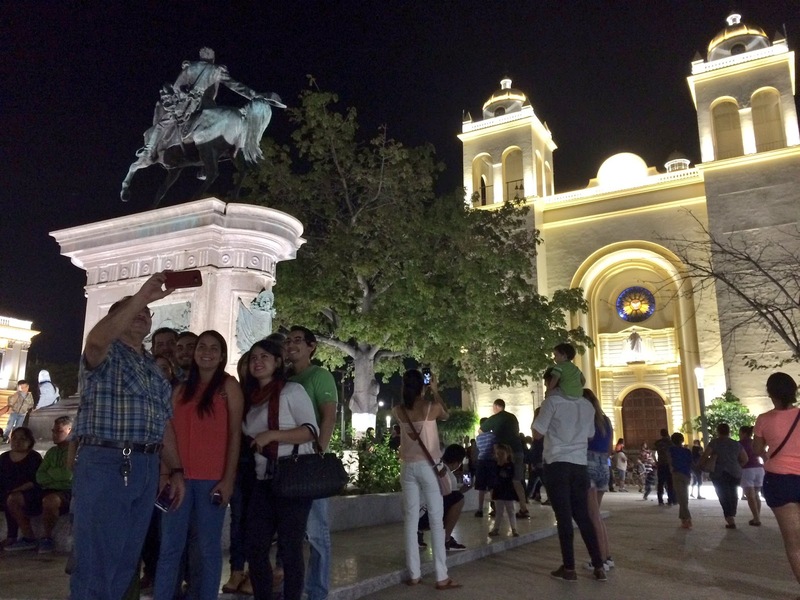 The plaza overhaul seems to be a Rorschach test for Salvadoran politics. 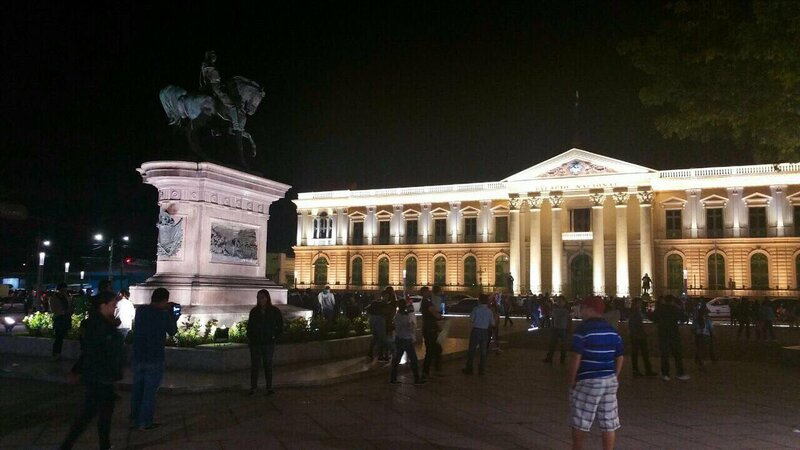 Bukele's opponents gripe that the restoration is Kitschy/architecturally inappropriate, that it is too expensive, that it is gimmicky and superficial, and that Bukele is claiming credit for work that was done in part by others. Bukele's supporters counter that the work breathes life into the previously stagnant city center, that it is a shot in the arm for a beleaguered capital, and that it portrays a positive vision which signifies more than the result of a single project: it exemplifies Bukele's vision of "New Ideas" that can propel El Salvador's image forward. The reality is probably somewhere in between. 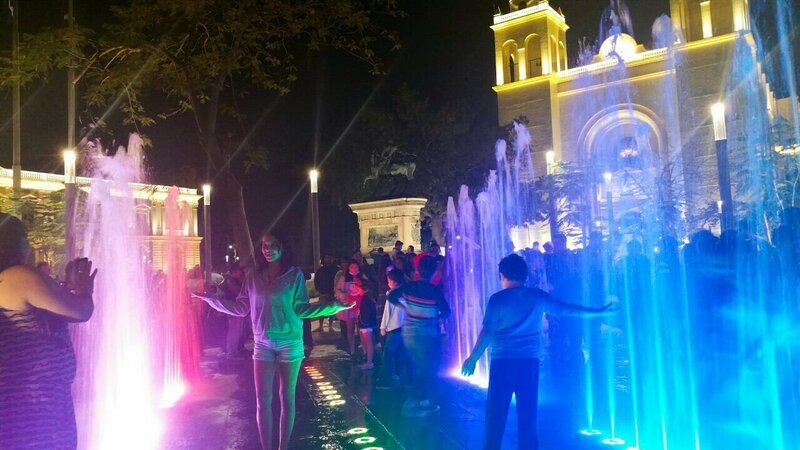 Earlier mayors have tried to remodel parks (notably, Norman Quijano tried to clear street vendors from downtown and revamped Plaza Las Americas, aka, Divino Salvador Park), but his visions of urban renewal did not live up to the expectations. Still, there is no denying that the Plaza Barrios makeover is popular--I hope, because it inspires capitalinos to envision what San Salvador can look like if they begin to reclaim it from the gangs, even if it is one block at a time.